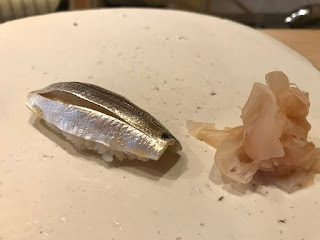 On Thursday I had my first bona fide omakase experience at Sushi Saito, the latest premium high-end Japanese restaurant to open in Hong Kong. Select media were given a sneak peek, but no free lunches here -- we all shelled out HK$1,480 plus 10 percent for the lunch. A few days before we were reminded to arrive 15 minutes before the seating at noon -- if you don't show up you will be charged, and do not wear any perfume or have a cigarette or cigar smell. 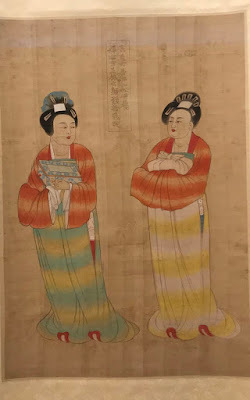 As a result, many of us worried about being late and arrived at least half an hour early to ride up to the 45th floor of the Four Seasons Hong Kong for the highly-anticipated meal. Sushi Saito is a three Michelin-starred restaurant that is also number 26 on the Asia's 50 Best Restaurant list that's located in Tokyo. Chef Takashi Saito is known for being very particular with his ingredients and only serves eight guests at a time in his small restaurant that is near impossible to get a reservation. So when there was an opportunity to try it here, I jumped at the chance. 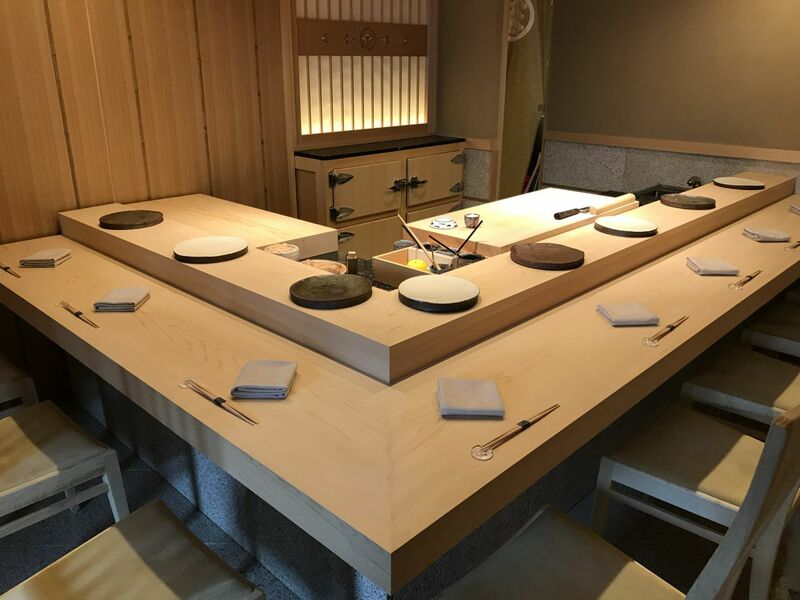 We soon understood why it was important not to wear any scent -- Saito wants his guests to soak in the fresh wood smell in the small restaurant that seats in total 16 seats, but today it was only seven. The large dining table seating three on one side, four on the other, the two thick slabs of gorgeous wood from a 400-year-old Japanese cypress. Apparently each time they wipe down the table top, the scent from the wood comes out. Once in a while they will sand it down with the finest sandpaper and then polish it. It was so smooth I couldn't help but keep stroking the table top throughout the meal. 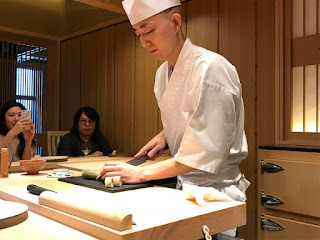 There is a ritualistic etiquette to the meal -- the chef makes a sushi for each person on their plate and it should be eaten practically right away because he has made it for you at that moment. There is no wasabi or soy sauce to dip it in, so just pick it up with your hand and put it in your mouth. To cleanse the palate, there is a small mound of finely shaved pickled ginger and it is refilled as necessary. He makes each piece per person and then goes around again making the next one using different seafood. 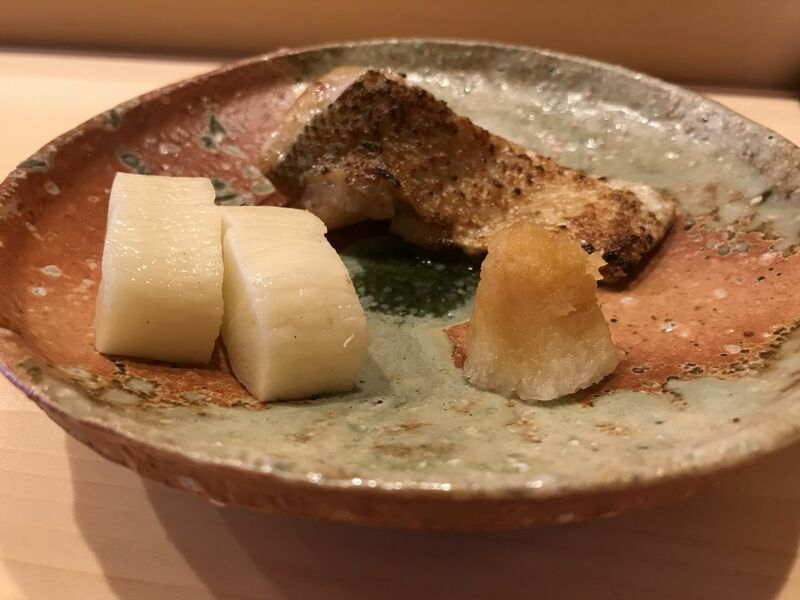 We started with a slice of monkfish liver seasoned in light soy, some sugar and seasoned with grated yuzu. I can't remember all the names of the other dishes, but they included grilled sea perch (divine), a small fish called kohada seasoned with lime juice, maguro or tuna, squid with a bit of lime juice, large prawn, and clam. This was followed by a slice from the futomaki roll with two cubes of tamago or sweet egg that is considered dessert, and miso soup. The whole meal was accompanied with Champagne -- Saito considers it the best pairing with sushi, even better than sake. 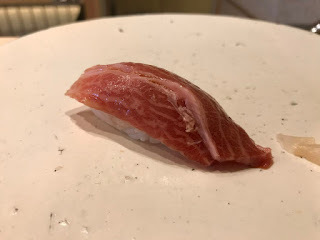 We were surprised to find that in the beginning the sushi rice was quite warm, and also when the chef de cuisine served uni or sea urchin, it was quite cold, having just literally been taken out of the refrigerator -- it should be around room temperature. But perhaps Saito prefers to keep the uni as fresh as possible and not sitting out too long. Nevertheless we quite enjoyed the experience and weren't stuffed either. We found out afterwards behind the bar is a cabinet that when opened reveals blocks of ice to keep the fish chilled. These are considered better than refrigerators that can dry the fish out. Saito wants the fish to be as fresh as possible. Since reservations here will be difficult to secure, I won't be going back to Sushi Saito anytime soon, but appreciated the opportunity to try it! $1,480 for lunch -- ouch! Any idea how much dinner at Sushi Saito will cost? BTW, kohada = gizzard shad. Re the tuna: It's red like akami but you can see the lines of fat... so I wonder if it's chu-toro? P.S. Just saw on its webpage that dinner is $3,280. Seriously ouch!